The World Upon a Globular Projection and with a Gazatteer of Information. 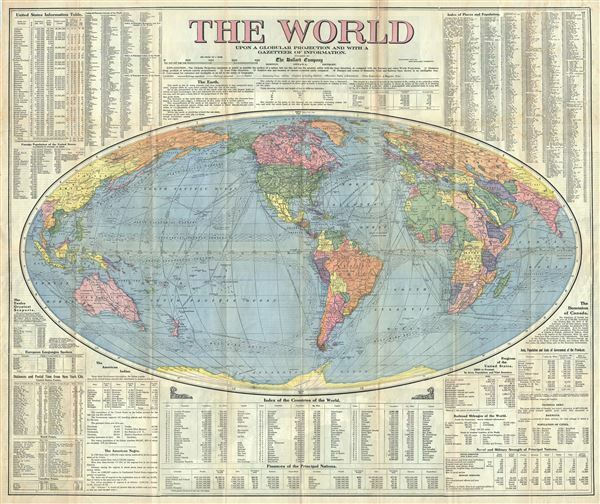 This is a large 1910 Bullard Company Gazetteer map of the World. Centered on North America and South America, it covers the entire world on a globular projection. The map is highly detailed, noting numerous cities, towns, islands, railways, rivers, coaling fields, battlefields, and a host of additional topographic features. ocean currents and shipping lines are also noted. The map proper is surrounded by numerous notes and explanations throughout with regard to the Earth, an index of the countries of the World, finances of the principal nations, railroad mileage of the world, naval and military strengths of principal nations, populations of cities, progress of the United States since 1800 in area, population and vital statistics, information on the Dominion of Canada, information table of the United States, the twelve greatest seaports, and much more. Verso contains additional statistics along with map of Cuba, sectional map of the Panama Canal, Eastern Asia with Japan and the Philippines, United States showing waterways, products and time bells. This map is copyrighted and issued in 1910 by The Bullard Company. Very good. Some toning and wear along original fold lines. Some foxing. Minor verso repair along some fold lines. Accompanied by original cardboard binder.